apparently we have a different way of doing this. You folks think that a Pot Pie - chicken, beef, pork, what have you, should be a pastry shell covered with a filling inside that is soupy and savory. In Philly, they make it thick. It should be roughly a pudding consistency. It may run out, but slowly. Think of "regular" yogurt (not the Greek kind), or a good vanilla pudding. Not solid, but not liquid. Gelatinous almost. That's what I wanted. After getting some of those 95 cent single serving microwave pot pies and being disappointed in them, I decided to make a Proper Pot Pie. I also wanted a roast chicken dinner that weekend, so we had that first. You see, the filling in a pot pie should be cooked properly first. Well done, but tender. Cooking a roast chicken with stuffing to 165F internal temperature was perfect. Then after it has been enjoyed, pull off all the meat. Separate and reserve 2 cups of chicken chunks for the filling then go to the store. So here is how to go about the rest - easily! What makes it so easy is that I'm using precooked and already prepared items to make this. Basically you are "assembling" it more than cooking it! Like I said, EASY but you do have to head to the supermarket for some items. You will need some mixed vegetables. Traditionally it is Carrots, Potatoes, Peas, String Beans, and perhaps Onions. I found a can of the stuff and thought that would be great. Mixed Vegetables. You see, if they aren't precooked, then you may find yourself having crunchy vegetables in your pot pie. That's never good - so get yourself at around 12 ounces or one can of either frozen or canned mixed vegetables. Your choice. Make sure you have 1/2 cup of milk in the house. Next, find yourself some proper soup for the filling. The recipe says condensed Cream of Chicken Soup. You want that to be thick right? It can be fat free if you prefer, and it can also be low sodium. We went that route since I simply don't prefer a lot of salt in my meal. Pick up some pre-shredded Cheddar Cheese for the filling. I always look for the lowest salt in this too, again that is my own preference. Make sure that it is at least 1 cup in the bag, although most packaged shredded cheese packs are 2 cups. Finally, since we said easy, we need one box of refrigerated pie crust. The Pastry kind that comes with two crusts per box. 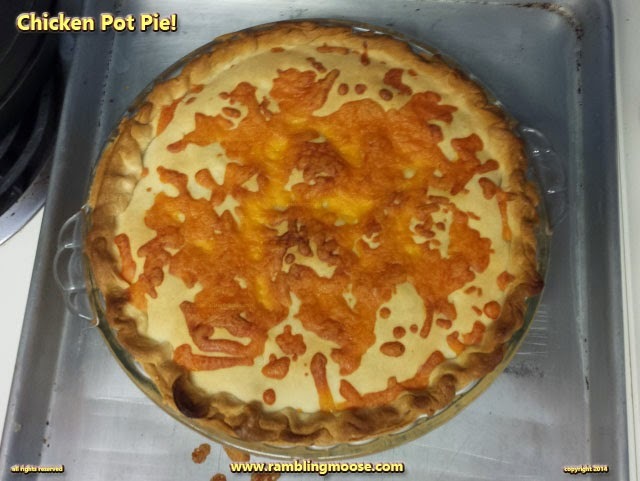 Making pie crust is really quite easy and takes a little time and care, but this is "bachelor chow" - so easy that anyone can do it. The preparation of this is a lot more simple than you would think, but you do have to make that pie crust. Trust me it's just as good the second day. It's a great way to use up leftovers, and works well with turkey or even tofu if you can find a vegetarian creamed soup and want to experiment. 1 package (about 14 ounces) refrigerated pie crust (2 crusts) at room temperature. 2 cups cubed cooked chicken - can be canned or leftover. 1 package (12 ounces) frozen (or canned) mixed vegetables, thawed. Carrots, Green Beans, Corn, Peas etc. Line the bottom of a 9 inch pie plate with one pie crust. Trim excess. Stir the soup, milk, chicken, and vegetables in a medium bowl. Spoon the chicken mixture into the pie plate. Sprinkle with 3/4 cup cheese. Place the remaining Pie Crust over the filling. Crimp the edges of the top and bottom crusts together. Using a sharp knife, cut several slits in the top crust. Sprinkle the crust with the remaining cheese.